A mind-blowing theatrical extravaganza that was the ultimate gift to fans and a glorious celebration of the band’s twenty-year history. On Friday night I was at The Forum in Kentish Town witnessing a very special one-off Lacuna Coil show celebrating 20 years of the Italian goth-metal band, who played a career-spanning set against a circus-themed backdrop featuring acrobats and flames! Originally scheduled to take place at the 2000-capacity O2 Empire in Shepherds Bush Empire, the show was moved to the larger 2,300-capacity O2 Forum in Kentish Town and, while not entirely sold out, the venue was packed with fans eager to witness this unique extravaganza, many of whom had queued for hours and some who had travelled from various corners of the world to witness what was billed as “The Greatest Show On Earth”. With no support act Lacuna Coil took to the stage around 8.15pm and were met with a roar of sheer delight and excitement from eager fans. They opened their set with “A Current Obsession”, with their trademark mixture of male/female vocals backed by heavy guitar riffs. The whole stage was set up like a circus tent with red fabric draped from the ceiling, clowns with red glowing eyes guarding each side of the stage, and a bespoke “119 show” carnival-esque sign gently glowing behind the drummer. 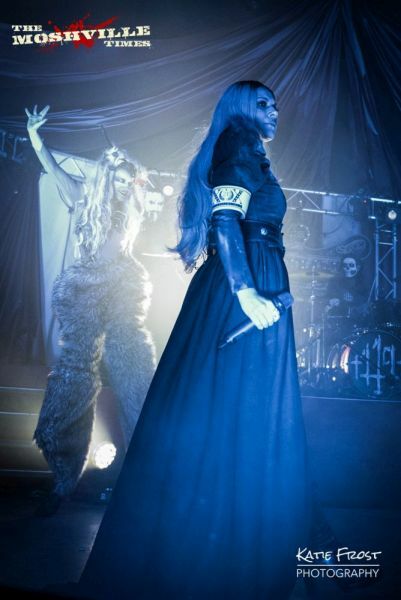 The band were joined on stage by elaborately-dressed stilt-walkers who weaved their way around the band and gave us all a taste of the theatrical feast that we were about to enjoy. After an engaging but relatively sedate start to the set, the band turned up the heat for fan-favourite “Blood, Tears, Dust” as flame-wielding dancers in sparkly leotards and big curly white wigs moved around the stage around Cristina who herself had flames rising from her hands as she sang. Throughout the show acrobats dressed as clowns performed dances, mimes and acrobatics to accompany the songs. For “The House of Shame” the stage was transformed into an asylum and a wonderfully choreographed performance took place between Cristina and Andrea and eerie figures emerging from ornate picture frames who attempted to grab the vocalists as they sang. 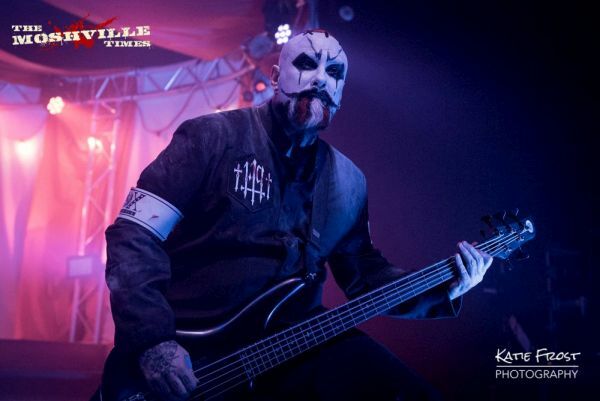 As well as playing tracks from their eight studio albums including Delirum (reviewed by Amy), the band also played a selection of songs never played live before including “Soul Into Hades” and “Comalies”. The end of the main part of the band’s set was followed by an eerie dance performance as Christina and a pianist performed a magical and emotional stripped-down rendition of “Falling Again” and “Wide Awake”, for which Cristina was hoisted in the air dressed in a billowing parachute of fabric which left the audience speechless! Lacuna Coil ended the show with what has become their anthem, “Nothing Stands In Our Way” as an acrobat twirled from a hoop suspended in the air; sparks spouting from her hands. What an absolutely wonderful experience. The band and their team had clearly put a huge amount of effort into the show which was intended to be a celebration of twenty successful years of the band and certainly delivered. There was so much attention to detail; from the theatrical stage set to the choreography and the costume changes. It was a feast for the eyes as well as the ears because not only did we get an evening of great music, but we also got to witness a glorious cirque du soleil-esque show…which is not something you get to do very often!